We're proud to work with businesses large and small, the length and breadth of the country. Keep up with the latest news from our SPR client family. The words ‘adventure tourism’ and ‘Queenstown’ go hand-in-hand. And now one of the tourism resort’s longest-standing adventure tourism companies is revving up the adventure experience to a whole new level. Off Road Queenstown, a pioneer in everything off road since its inception over 27 years ago, is offering those seeking the ultimate Kiwi adventure the opportunity of a lifetime. Their new tailor-made private expeditions on four wheels or two – off-road (of course) through the central South Island — give groups exclusive access to some of world’s most stunning and remote off-road terrain and landscapes. Travelling between five to seven hours a day on off-road tracks that scour remote high country stations, cross fast-flowing rivers and consign a sealed road to nothing but a distant memory, their expeditions can literally go ‘coast to coast’ in the course of one epic off-road journey. Off Road Queenstown, a family-owned and run business, has over 350,000 combined hours of experience in this terrain, unrivalled knowledge of the areas they traverse and unprecedented land access around the central South Island. Their full day and multi-day private tours morph endless fun, excitement and off-road adrenalin rushes into expeditions of such monumental proportions they produce the tales that legends are made of. “There’s a well-worn tourist trail throughout the South Island but we take clients on our full and multi-day tours to places they didn’t even know exist, let alone realise they could access,” said Off Road Queenstown owner Denis Columb. While the company’s been operating dirt bike and quad bike tours since 1989, catering for all ability levels and youngsters as young as six (accompanied by adults), the off-road side-by-side buggy tours are a new and exciting addition to the menu. 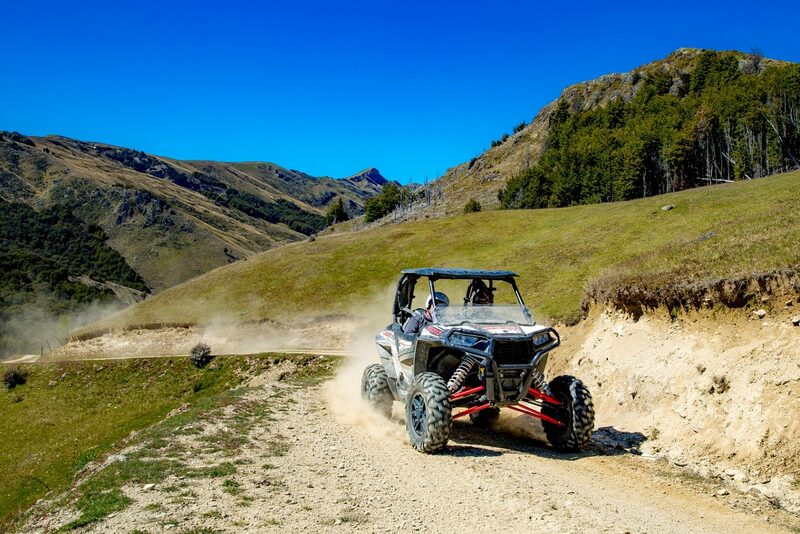 “Our extended buggy expeditions are the absolute pinnacle of bespoke adventure packages in New Zealand,” said Denis’s son Lachie, Off Road Queenstown’s head guide and a former national ATV motorcycling champion. “Driving the easy-to-use Yamaha Wolverine sports buggies opens up these adventures to more novice off-road clients, but they always come with the support of hugely qualified guides. His brother Scott, an eight-time NZ Super and Motocross champion, and Dirt Bike Tours NZ head guide, said the extended tours enabled groups to travel across more varied landscapes, terrain and every off-road trail they could imagine. “We take them on trails from scenic to extreme and everything’s tailoured to that specific group of clients,” he said. “There’s nowhere else in the world where a landscape is more suited to using these top-of-the-range off-road machines to the limits of their amazing capabilities. “These private group packages are all-inclusive of buggies/ dirt bikes, gear, accommodation, meals, transfers and land access so there’s nothing to do other than make the most of trails from scenic to extreme, fast-flowing tracks or more technical trails. These bespoke tours are limited to a few lucky groups each year so early bookings are recommended. From humble beginnings in 1989 the company’s grown to be one of the largest off-road tour companies in the world, with well over 100 top of the range off-road machines including dirt bikes, quad/ATV bikes, buggies, 4×4 Landcruisers and large adventure bikes. Click here to visit Off Road Adventures’ website. The opening of the new Crowne Plaza Christchurch last weekend has been deemed a runaway success – as hundreds of visitors and locals poured through the doors. Re-opening in the revitalised city centre, feedback from all who visited or stayed was unwaveringly positive, with many telling staff they had been waiting patiently for the day to come. 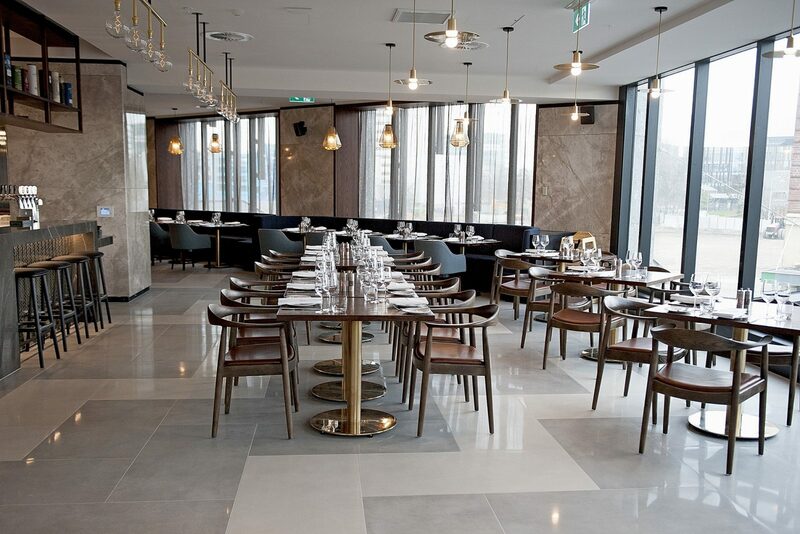 As the largest upscale hotel in the Christchurch CBD with 204 modern rooms, a café, bar and restaurant and four modern event spaces, the hotel has positioned itself as a contemporary space for its local community where guests can ‘connect’ to the city. Just how popular it proved over its opening weekend took even seasoned staff by surprise. After making a last-minute decision to open Café 1851 on Saturday, the decision was more than justified by the sale of more than 300 cups of fresh Mojo coffee. Market Place bar and restaurant was humming over the weekend with more than 200 customers enjoying the food, wine and service. Ninety lucky guests were the first to stay in stunning designer rooms with views over the cityscape and out to the Canterbury Plains and Southern Alps, and Front Office Manager Krysten Butler was happily surprised by the number of ‘walk-in’ bookings received over the weekend, adding to the 11,000-plus bookings the hotel already has in its system. The hotel is supporting the local economy in more ways than one, employing approximately 80 staff in a wide range of roles. General Manager Reinier Eulink said he had received plenty of positive feedback since opening, with people “loving” the way the hotel looks. “When we finally opened the doors there were a million feelings going on. The sense of excitement was strongest, as well as the relief that we’d finally got there. The hotel’s café attendants and baristas had to agree, saying they served a “big mix” of locals, tourists and families, many of whom spilled out into the lobby area from the café, sitting in front of the fire with a coffee and something tasty from the food selection. The Scandanavian décor in the café drew special praise from many. Food and Beverage manager Cody Huxtable said there had been “intense preparation” to get everything ready for opening. Meanwhile Food and Beverage Projects Manager Serge Fernandes said the original plan had been to open the café on Monday but brought that forward at the last minute. Overall feedback from the weekend also included being impressed with the design changes to the building and the Social Wine Bar concept and menu. “Many of our staff didn’t realise just how closely people in Christchurch had been following our progress, so they loved chatting to them and seeing how excited they were,” said Reinier. The return of the brand to the city is a significant milestone for the owners of the building and the InterContinental Hotels Group (IHG®). Crowne Plaza Christchurch was one of three new hotels that IHG added to its portfolio in the region over the weekend, the others being Crowne Plaza Hawkesbury Valley and the Kirkton Park hotel in Australia. The new Crowne Plaza Christchurch is situated on the corner of Colombo and Armagh streets opposite Victoria Square. Two Queenstown-based creatives have today (Monday July 3) announced news of an exciting collaboration. Kimberly Whitelaw, 33, and Maranda Mitchell, 31, are joining forces to deliver a multi-disciplinary creative design studio as newly-branded Whitelaw Mitchell, renowned as the ‘littlest big agency’. Collaboration is at the very heart of the business for the female leaders. Kimberly thrives on user interface design and development projects, while Maranda brings art direction, design, photography and cinematography to the table. Kimberly says both designers saw the partnership as a good opportunity to grow and evolve the existing Whitelaw Design business, founded in 2011. “I’m thrilled that my business has gone from strength to strength since I ‘set up shop’ in Queenstown,” she says. “Maranda has worked for me as a designer for the past eighteen months and I’m confident I’ve found a trusted business partner who complements my skillset and can help take the business to new heights. Known as the brains behind former brand Whitelaw Design, Kimberly has worked as a graphic and web designer for ten years in Scotland, London and Queenstown. Maranda said she doesn’t just design art, she consumes it 24/7. “Our highly collaborative approach and our big city mentality in a small town is what works well for us,” she says. “We’re ‘yin and yang’ in terms of our personalities, what we offer and even how we connect with our clients. “The partnership has allowed us to expand on our skillsets, lean on each other’s strengths and take on bigger challenges. Maranda said she was ecstatic to be working with someone as talented as Kimberly, and describes her as “a critical part of the puzzle”. With over 12 years’ experience designing for boutique agencies and large-scale firms in California including Pacific Communications and Baby Bird Communications, Maranda’s design exploration led her to New Zealand in 2015. “I want to create a more influential impact and rattle a few cages in New Zealand’s design community,” she says. “Art should be impactful, catch people’s attention and be open to interpretation. “Kimberly and I both wear many hats – problem solvers, artists, thought leaders and successful women in business. Kimberly said their vision was to build a timeless, distinguished design agency, reflecting client brand ethos and delivering results beyond expectations. “We’ll continue to build our client relationships through a personable and down-to-earth approach. We’re proud of every one of our clients, so thank you for growing with us,” she says. Holiday Inn Auckland Airport today announced (June 27 2017) a full refurbishment of all public spaces, starting next month. 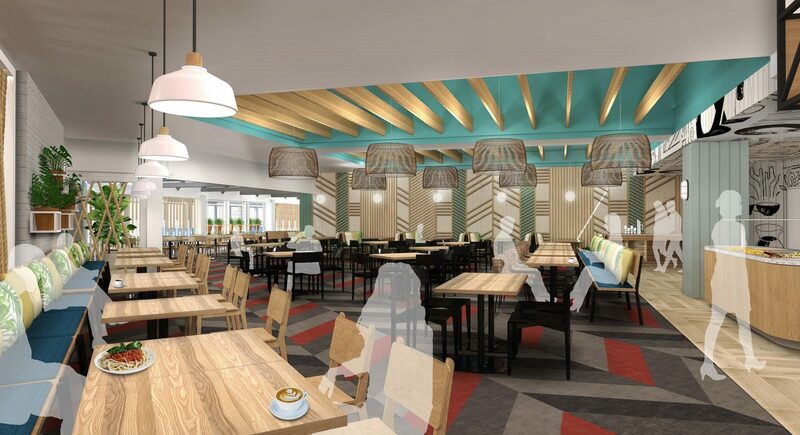 The three-million-dollar redevelopment will transform the hotel’s public spaces, including the restaurant and bar, function rooms, hotel lobby, reception and swimming pool, to provide a more contemporary and tranquil environment for guests and visitors. The redevelopment is scheduled for completion in January 2018. Building on the heritage, community and cultural significance of the hotels location, creative design agency Designworks is tasked with drawing inspiration from New Zealand and Pacific to create a ‘welcoming heart’ for the hotel. Keeping true to the Pacific heart and holiday concept, Vapor Restaurant will take on a more relaxed and friendly atmosphere with added bursts of colour, life and energy. The properties Porte Cochere will get a clean and fresh new look thanks to new lighting, greenery and exterior panels. Halo Bar will get a full structural refurbishment that includes the removal of existing floor and ceiling features, transforming the ground floor space. This will open up the bar to the new swimming pool deck where guests can sit back and enjoy a drink or casual bite to eat. New furniture, flooring, light fixtures and artwork throughout will add a modern twist, creating spaces that are vibrant, inviting and unique. Holiday Inn Auckland Airport is located just minutes from Auckland Airport terminals and all major motorways, and General Manager Scott Schaefer said the refurbishment would “revolutionise” guest and visitor experiences. “We’re extremely excited to embark on this fantastic project to transform Holiday Inn Auckland Airport,” he said. A mix of eclectic furniture including chunky timber communal tables and upholstered soft-seating furniture will be complemented by geometric timber cladding, purposely mismatched lighting and bold graphics for interior walls. Existing Maori wood carvings, gifted by the local iwi, will be injected into the design and natural rope screens will create subtle dividers throughout the open plan space. Stakeholders working on the redevelopment include Cockpit International, InterContinental Hotels Group (IHG), Designworks, JSC Ltd and construction company Format. Mr Schaefer said the comprehensive project and investment by building owners Cockpit International demonstrated their commitment to Auckland and New Zealand tourism. Click here to visit Holiday Inn Auckland Airport’s website.